3 Bedroom End of Terrace House For Sale in Penzance for Offers Over £435,000. This is a perfect family or holiday home. Expansive direct sea views from St Michaels Mount to Newlyn. The property has a prominent position along the promenade facing out across Mounts Bay with expansive sea views. The main entrance is at the rear of the house which leads into the unique bright and spacious double glazed garden reception room, which is also used as a conservatory sun lounge looking across the garden. From this room you enter the superb sitting room with double glazed bay windows drawing you to the sea views. This room is decorated to a high standard with a feature Adams style gas fire place and a decorative pillared spindle staircase rising to the first floor. Staying on the ground floor a single step down leads through to the dining room where large windows allow in plenty of light ideal for family and formal dining. From the dining room is the open plan L shaped kitchen finished to a high standard, perfect for the chef of the house. Fitted with an extensive range of bespoke units, large larder cupboard, granite work surfaces, a range of fitted appliances and a Rangemaster electric oven having a five ring gas hob. There is also a two seater breakfast bar plus concealed lighting creating the ambiance. 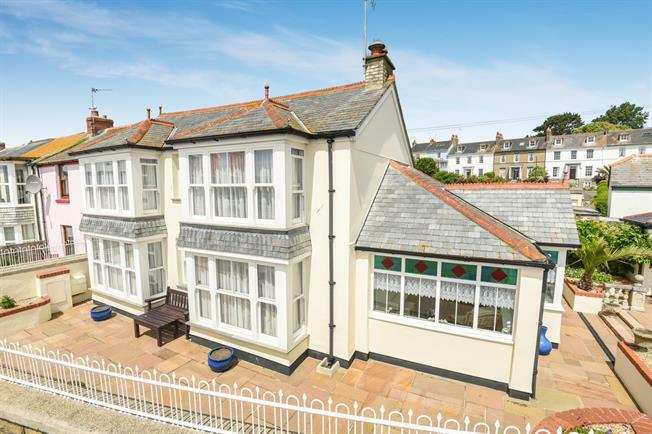 On the first floor at the front of the property is the impressive master bedroom perfect to take in the superb expansive sea views from the double glazed bay window. This room also has the benefit of built-in-wardrobes. The second double bedroom with double glazed bay window also has the same sea views, a great guest room and again with fitted wardrobes. The ample third double bedroom room located to the rear of the property has large windows and a built-in-wardrobe. Across the landing is the separate wc with wash-hand basin plus a surprising spacious bathroom perfect for a family or staying guest. This has been fitted with modern white suite comprising of a separate shower cubical and bath to relax in. The walled split level Mediterranean style garden lies to the front and side of the property paved in Indian slate. There are a variety of circular gravel beds with exotic plants, trees and shrubs plus a feature fountain. Screening creates a private sun bathing or barbeque area great for family or staying guests. There is also a summer house for garden furniture storage and the all important detached garage creating the off road parking. This also has the potential to be converted to a small holiday let with the correct planning permission. The property has mains water, electricity and drainage. Gas central heating. Double glazing throughout. The Council Tax Band is E.
Penzance is one of Cornwall's most famous and vibrant larger coastal towns and an extremely popular tourist destination. The town centre offers a wealth of shops, cafes, hotels, restaurants, plus a variety of historic architecture with attractions such as the refurbished Jubilee Pool, the art deco lido and stunning subtropical gardens of Morrab and Penlee. The promenade stretches alongside a popular beach with walks to St Michael's Mount at Marazion and Newlyn harbour in the opposite direction popular with artists and art galleries.